This commissioned piece starts with the elegant beauty of a centuries-old violin. It had played its last song, but now placed in an art piece, the beauty continues. 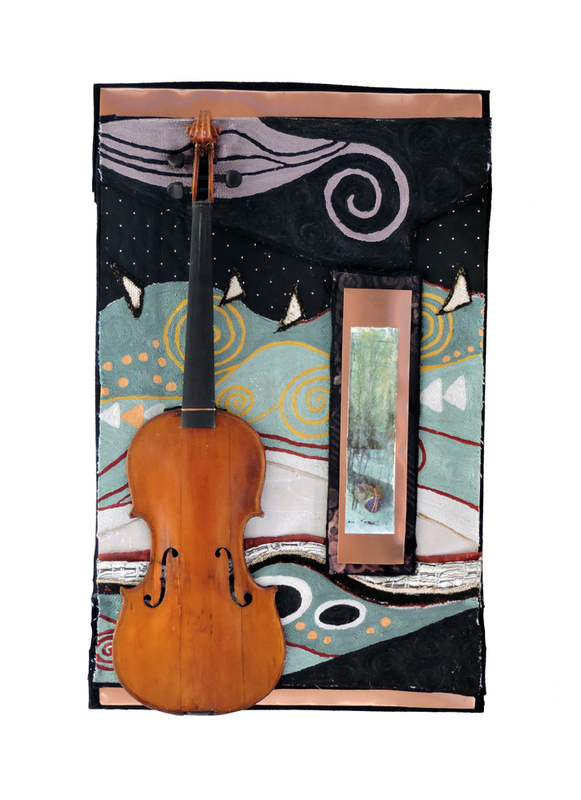 I juxtaposed this violin over a collaged embroidery that represents Northumberland’s hills and all the majesty of our surrounding landscape. The background is a collage of a landscape embroidery, acrylic on canvas, African mudcloth, and of new fabrics found just for this piece. I wanted to give the feeling of a visual song, where looking at the piece, one can almost hear the music over the hills. Juxtaposed with this background is a photo of trees reflected in snow, taken in winter time in the Northumberland forest which was then transferred onto canvas and painted. In the same way that the image is reflected, so is the song of the violin echoed over the hills. The piece is mounted in a 24″ x 36″ museum-quality, shadow box frame.